Kazakh pilot cosmonaut 1991. 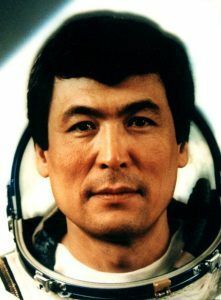 First Kazakh astronaut. Status: Inactive; Active 1991-1991. Born: 1946-07-17. Spaceflights: 1 . Total time in space: 7.93 days. Birth Place: Karkaralinsk, Karaganda. Graduated from Air Force Institute Soviet Air Force parachutist, test pilot. 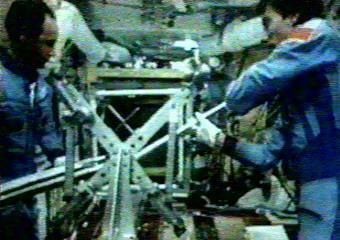 Cosmonaut training January 1990 - September 1990. From January 1993 General Director of the National Aerospace Agency, Republic of Kazakhstan. He was also a member of parliament. Later a pensioner and consultant. Family: Cosmonaut. Country: Kazakhstan. Spacecraft: Mir. Flights: Soyuz TM-12, Soyuz TM-12 Juno, Soyuz TM-12 Mir LD-3, Soyuz TM-13 Austromir, Soyuz TM-14A, Soyuz TM-14B. Agency: VVS. Bibliography: 4452, 5128. Aubakirov on way to launch vehicle. 1946 July 17 - . Birth of Toktar Ongarbaevich Aubakirov - . Nation: Kazakhstan. Related Persons: Aubakirov. Kazakh pilot cosmonaut 1991. 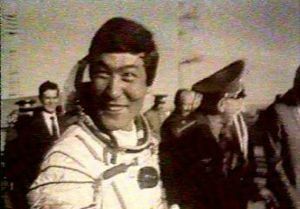 First Kazakh astronaut. 1 spaceflight, 7.9 days in space. Flew to orbit on Soyuz TM-13 (1991)..
1991 January 21 - . Kazakhstan Cosmonaut Training Group selected. - . Nation: Kazakhstan. Related Persons: Aubakirov. Kazakh astronaut trained for flights to the Mir space station..
1991 October 2 - . 05:59 GMT - . Launch Site: Baikonur. Launch Complex: Baikonur LC1. LV Family: R-7. Launch Vehicle: Soyuz-U2. Soyuz TM-13 - . Call Sign: Donbass (Donbass - River Don basin). Crew: Aubakirov, Viehboeck, Volkov, Aleksandr. Backup Crew: Lothaller, Musabayev, Viktorenko. Payload: Soyuz TM s/n 63. Mass: 7,150 kg (15,760 lb). Nation: Russia. Agency: MOM. Program: Mir. Class: Manned. Type: Manned spacecraft. Flight: Soyuz TM-12, Soyuz TM-12 Mir LD-3, Soyuz TM-13, Soyuz TM-13 Austromir. Spacecraft Bus: Soyuz. Spacecraft: Soyuz TM. Duration: 175.12 days. Decay Date: 1992-03-25 . USAF Sat Cat: 21735 . COSPAR: 1991-069A. Apogee: 232 km (144 mi). Perigee: 195 km (121 mi). Inclination: 51.70 deg. Period: 88.80 min. Manned three crew. Docked with Mir. Mir Expedition EO-10. Transported to the Mir manned orbital station an international crew comprising the cosmonauts A Volkov (USSR), T Aubakirov (USSR) and F. Viehbock (Austria), to conduct joint scientific and technical research with the cosmonauts A. Artsebarsky and S Krikalev. Austria paid $ 7 million for mission. Kazakh cosmonaut added at last minute. 1991 October 10 - . Landing of Soyuz TM-12 - . Return Crew: Artsebarsky, Aubakirov, Viehboeck. Nation: Russia. Related Persons: Artsebarsky, Aubakirov, Viehboeck. Program: Mir. Flight: Soyuz TM-12, Soyuz TM-12 Mir LD-3, Soyuz TM-13 Austromir. Soyuz TM-12 landed at 04:11 GMT with the crew of Artsebarsky, Aubakirov and Viehboeck aboard..
Soyuz TM-14B (cancelled) - . Crew: Aleksandrov, Aubakirov, Korzun. Backup Crew: Laveykin, Musabayev, Tsibliyev. Nation: Russia. Program: Mir. Flight: Soyuz TM-14B. Spacecraft Bus: Soyuz. Spacecraft: Soyuz TM. Soyuz TM-13 and TM-14 crews were reshuffled extensively due to commercial seat bookings by Austria and Germany and the necessity of flying a Kazakh-born cosmonaut as part of the Baikonur rental agreement. This was the second crew assignment. The Kazakh researchers were moved to the earlier Soyuz TM-13 flight and paying German researchers took their place in the final crew.